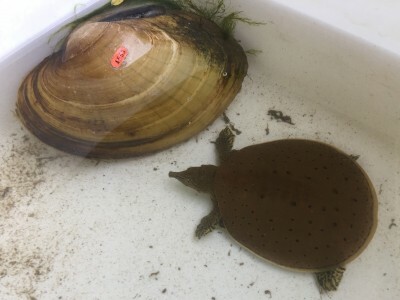 UBAP Malacologists Sarah Douglass and Jeremy Tiemann wrote an article for the Fall 2018 issue of Illinois Audubon: “The Enigmatic Asian Clam.” Asian Clams are an invasive species that became established in the Midwest in the 1960s. 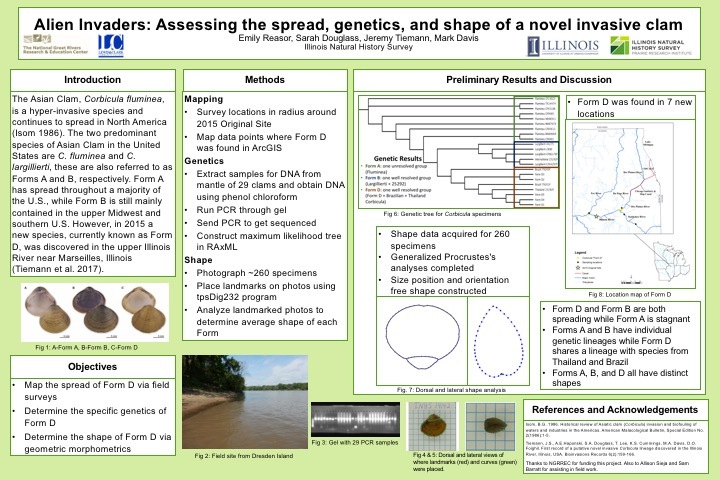 Douglass and Tiemann identified an unknown species of Asian Clam found in the Illinois River in 2015 and have been studying its distribution. 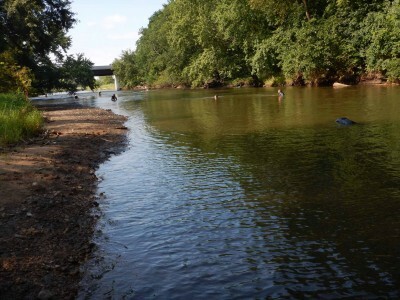 They plan to examine the effect of Asian Clams on the growth of native mussels in Illinois streams. 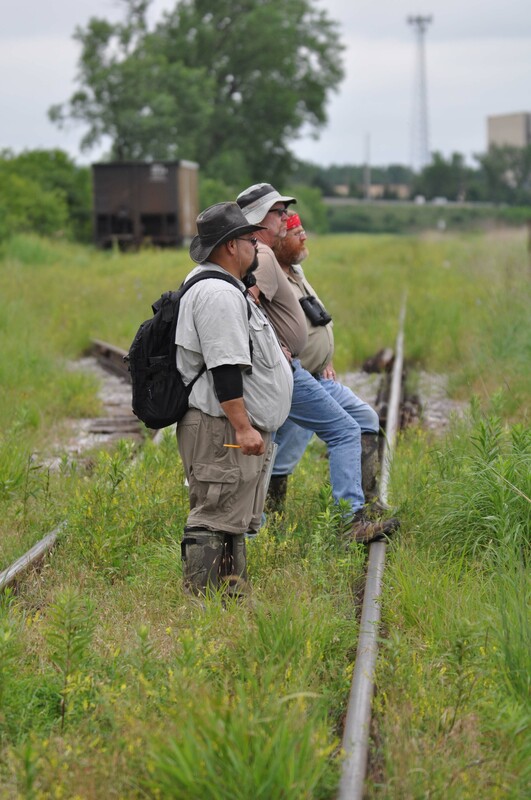 The article is available from Illinois Audubon or by contacting the authors. 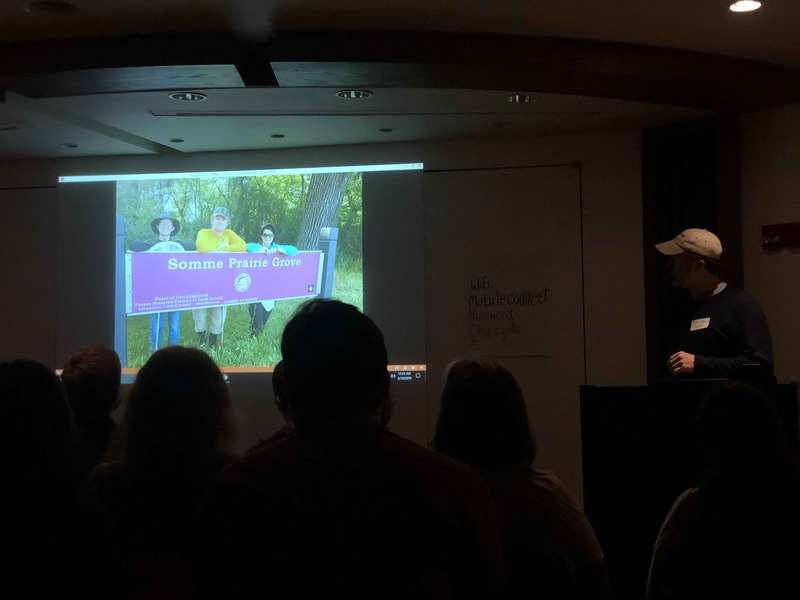 UBAP Ichthyologist Andrew Stites wrote a field account for the Illinois News Bureau’s Behind the Scenes to accompany a recent paper by Josh Sherwood, Andrew Stites, Michael Dreslik, and Jeremy Tiemann. 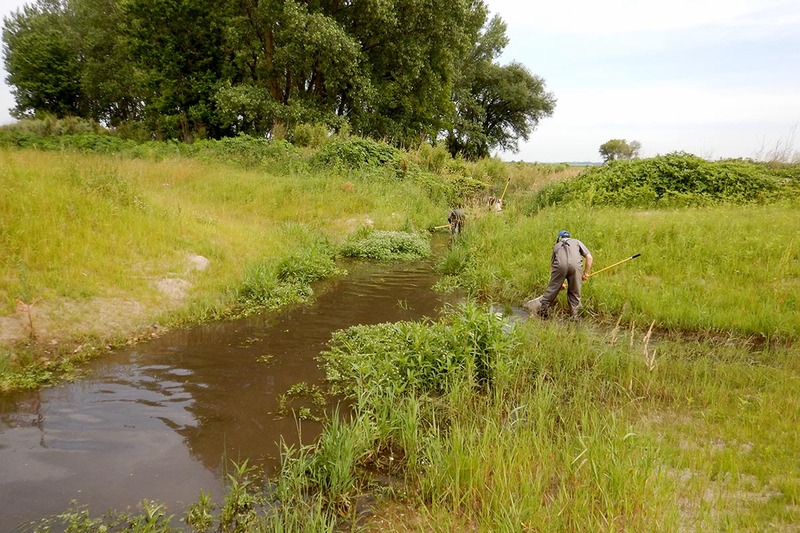 The paper, “Predicting the range of a regionally threatened, benthic fish using species distribution models and field surveys” developed a species distribution model for the state endangered Iowa Darter, after finding it in several new locations. This work was sponsored by the Illinois Tollway. 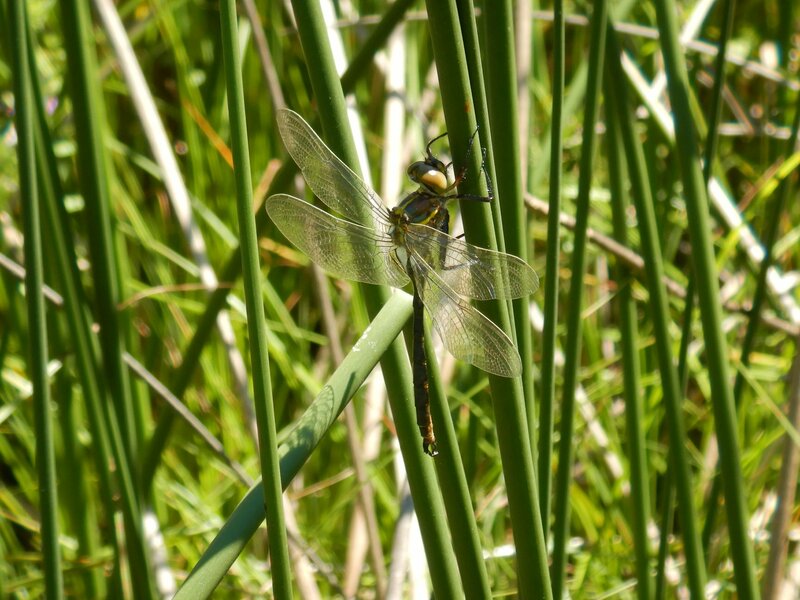 The Hine’s Emerald Dragonfly (Somatochlora hineana), a dark bodied dragonfly with bright green eyes, is a federally endangered species that lives in spring fed marshes and sedge meadows. 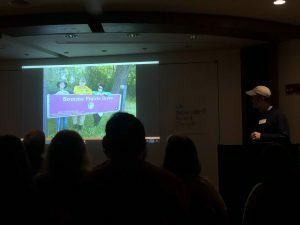 The biggest threat to the species is habitat loss and currently the only known populations are in Illinois, Michigan, Missouri, and Wisconsin. Hine’s Emerald Dragonflies spend most of their life as an aquatic nymph. After 2-4 years, and several molts, the nymph climbs up onto vegetation and molts one final time. The wings unfold and the soft body hardens. 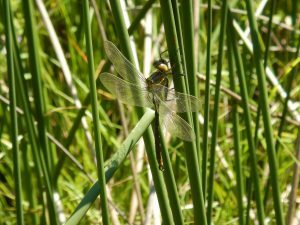 While some dragonfly species can be found flying throughout the summer and into the fall, the Hine’s flight season is much shorter. 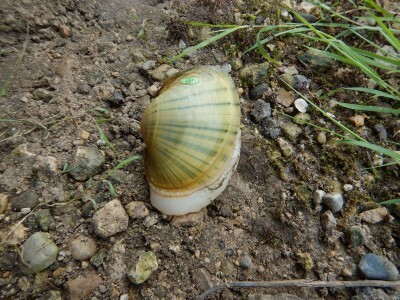 Adults emerge from late June through mid-July. 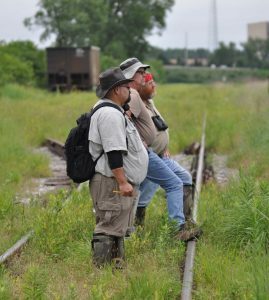 One bright and sunny day at the end of June, I was able to accompany 2 of the state’s top dragonfly experts, Richard Day and Jim Wiker to one of the few remaining populations in Illinois. 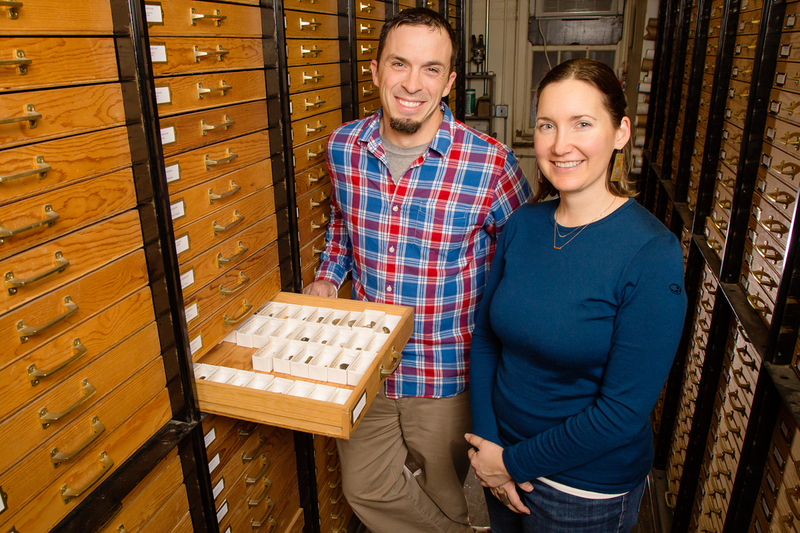 Equipped with sharp eyes and binoculars, they are part of a study with Erika Bilger and Dr. Mike Dreslik to design a non-invasive, rapid survey protocol for documenting and tracking populations of this endangered insect. 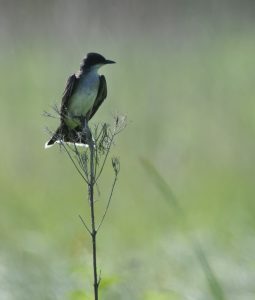 As the day warmed, dragonflies took flight, often followed by a flock of swallows and kingbirds. 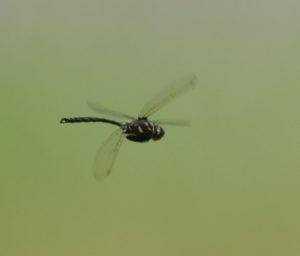 Being a rusty amateur dragonfly enthusiast, I pointed out the dragonflies I saw flying and had the professionals identify them, excited at how often my silent identification matched theirs. As my confidence grew, I’d point to a dragonfly and offer a hesitant ID. A few hours into the day, Wiker spotted a black bodied dragonfly with bright green eyes darting around the wetland and called out “Hine’s!” All eyes turned to where he was pointing. This was my first time seeing a Hine’s Emerald and Day’s first time seeing one in Illinois. Truth be told, I had to trust them because it was moving too fast for me to fully process. We continued our surveys throughout the afternoon, with Wiker and Day spotting additional Hine’s Emeralds and my eyes and camera missing all of them. Even though we saw at least 14 species of dragonfly, I returned home slightly disappointed, but nothing compared to the next day. Sitting in my office, the phone rang and Mike Dreslik excitedly told me they were looking at a teneral (freshly emerged, not yet hardened) Hine’s Emerald on a cattail! Dragonflies can’t fly until their wings harden, so they were able to stand back and admire this individual. Determined to actually see a Hine’s, I returned to the site with them for three days the following week. While most people were enjoying barbecues and fireworks, I was in a wet prairie straining to see every insect zipping by me. 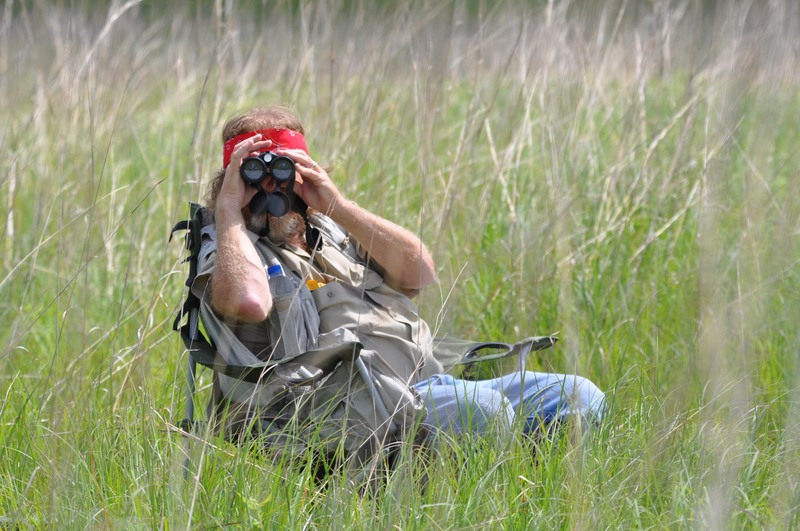 On my last day, with temperatures in the 90’s, and the clouds promised by the weatherman non-existent, I thought I might have been hallucinating when Wiker began excitedly pointing out a Hine’s patrolling a small area in front of me. The curious male flew back and forth over his territory, occasionally turning towards me with his bright green eyes. Dragonflies have greater maneuvering ability than a helicopter, quickly changing direction and zipping off to your right only to return from your left. 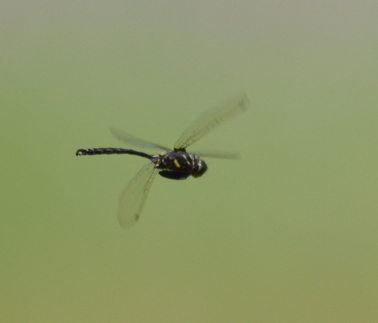 I watched this dragonfly on patrol, he chased off other intruding dragonflies including another Hine’s emerald! 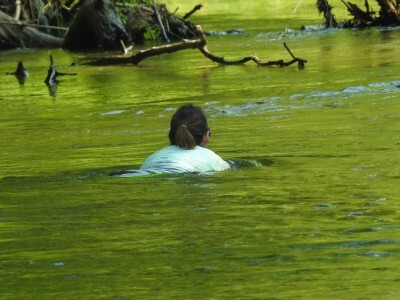 We even had a Hine’s Emerald female fly through the site! I continued to watch the male patrol until it was time to move to our next site. 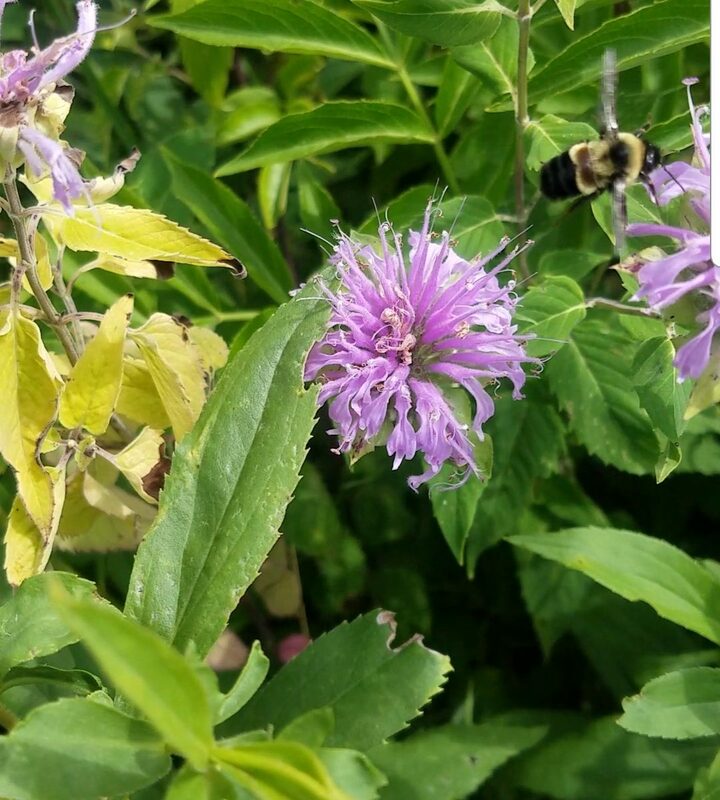 While conducting surveys today in DuPage County, INHS entomologist Jason Robinson and his assistant Maria Repisak came across Rusty Patched Bumblebees at two sites! This species was recently added to the US Endangered Species List because of its drastic decline across its range. 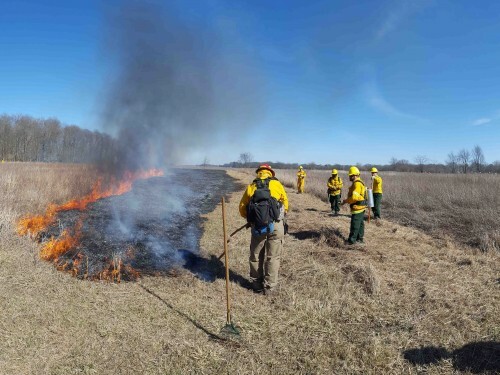 Travel around Illinois in the spring and you are likely to see fields on fire. 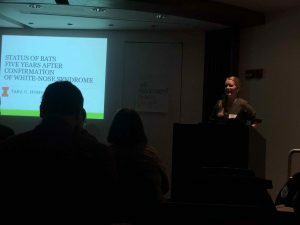 Many of these are intentionally set to aid land managers in reaching ecological goals. 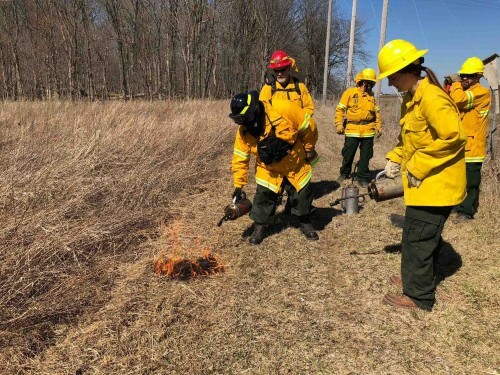 Prescribed burns can remove woody vegetation from prairies, remove invasive species, cycle nutrients back into the soil, and open up the canopy. 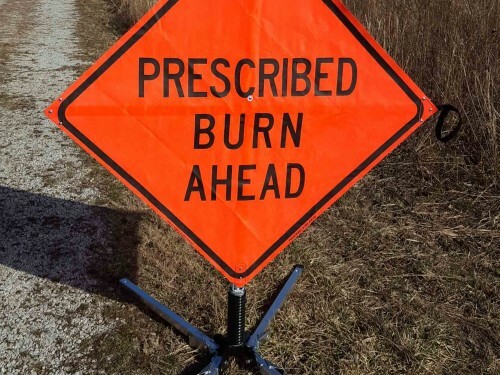 These prescribed burns require much preparation and training. 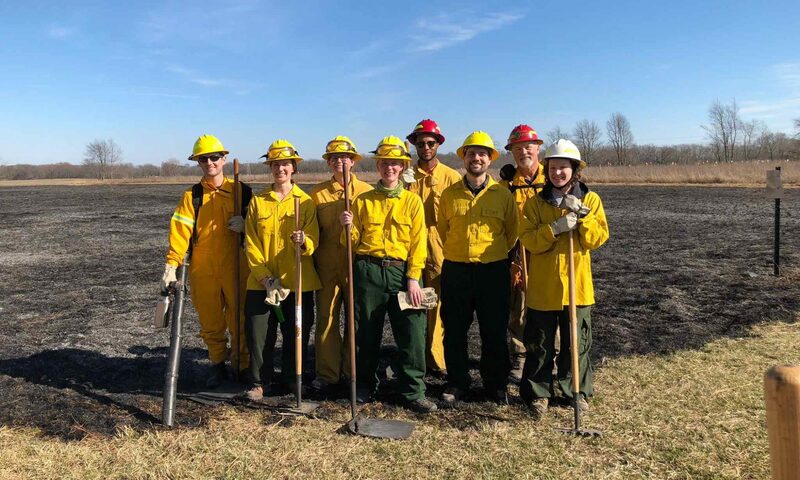 Last week a group of staff from the Population and Community Ecology Lab (PACE lab) became certified to participate in prescribed burns. 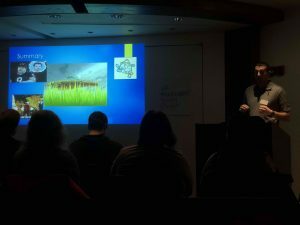 Before being allowed to light our first fire, we had to complete online courses through the National Wildfire Coordinating Group to learn how to put out a wildfire. 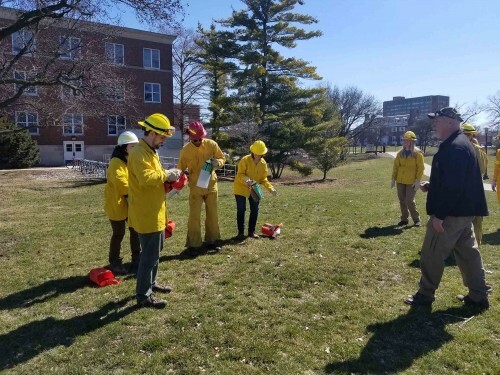 Through the courses – Human Factors in the Wildland Fire Service, Introduction to Wildland Fire Behavior, and Firefighter Training – we learned how to assess fire and weather conditions, control a fire, think critically in stressful situations, and survive when things go wrong. 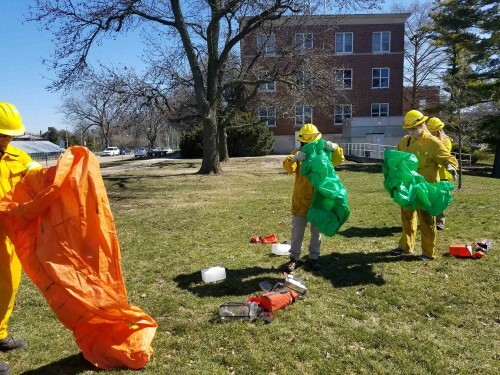 Our final day of coursework involved classroom activities, learning about different prescribed burn techniques, trying out personal protective equipment (PPE), practicing deployment of a fire shelter, and finally, starting a fire. 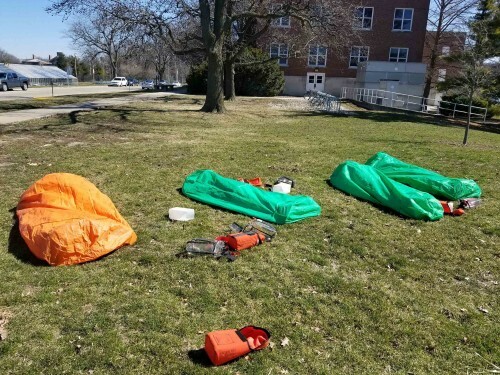 The U of I Committee on Natural Areas (CNA) had a small plot of land that needed to be burned north of campus. 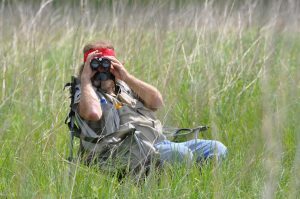 When we arrived, we found clear blue skies, light wind, and a piece of grassland bordered by woodlands full of singing Chorus Frogs to the north, privately owned bean fields to the east, and a long-term research project to the south. Jamie and Nate from the CNA had mowed down a 10ft wide swath of grass between the grassland and research plot. 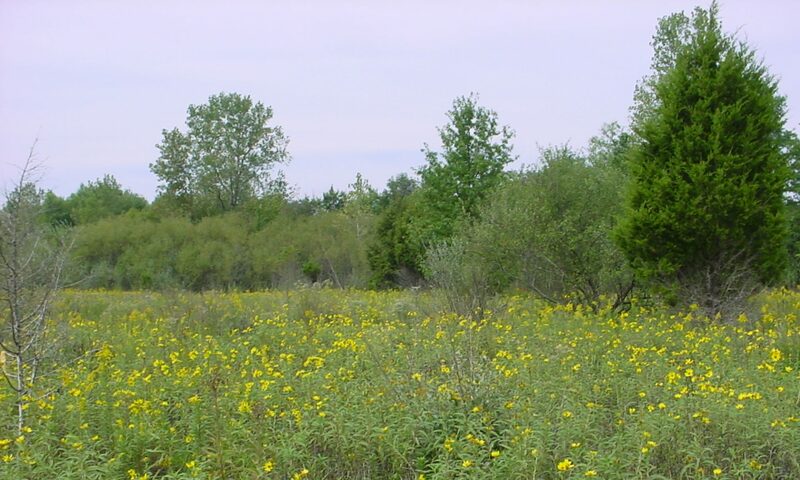 The woodland and bean field were separated from the prairie by a gravel and dirt path. This would be our control line. Assessing the wind direction (from the NW), and the location of the surrounding areas we wanted to leave unburnt, we decided to start our backfire on the SE side of the prairie. 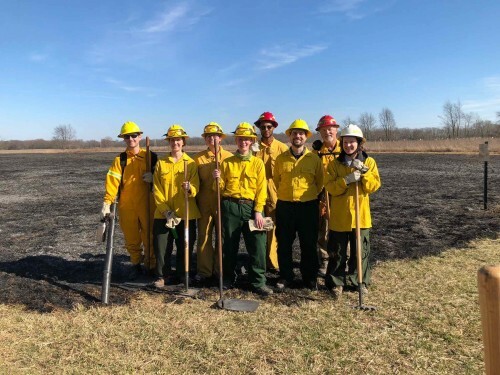 By starting against the wind, we could slowly create a burned area bordering the remaining grassland creating an area that fire could not cross back over. 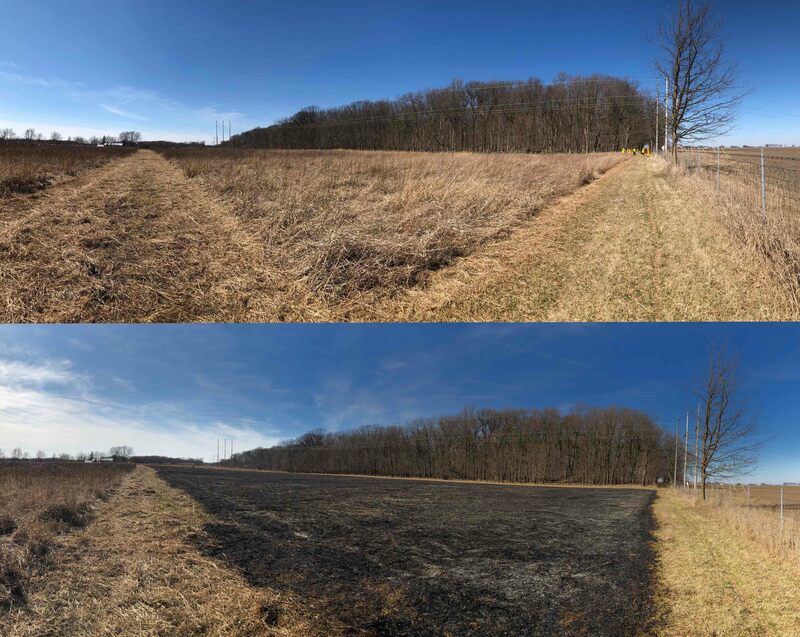 If we started on the NW side, the wind would sweep the fire quickly across the entire field and likely into the areas we didn’t want to burn. 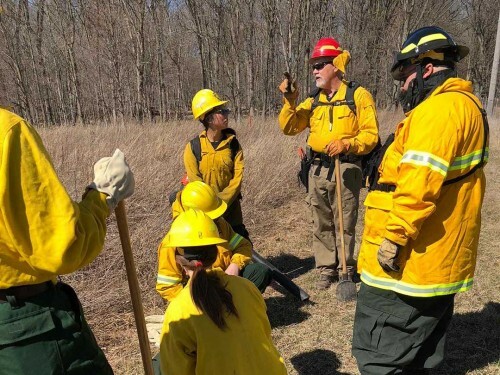 Wearing hardhats, goggles, and Nomex suits, we armed ourselves with backpack waterpumps, drip torches, fire rakes, fire flappers, and McLeods. We separated into two teams, one to burn the south side (Team 1) and one to burn the east side (Team 2). We quickly learned that things don’t always go as planned. 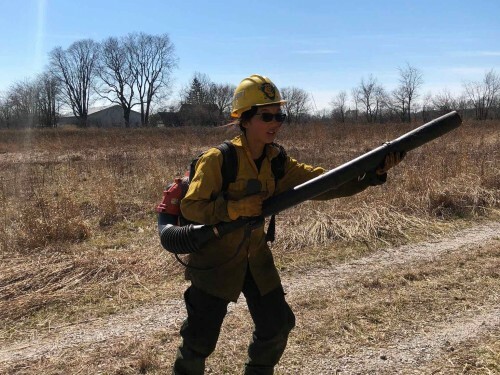 Team 1’s drip torch wouldn’t drip, making it impossible to start fire. Team 2 had less trouble spreading fire and things got hot fast! 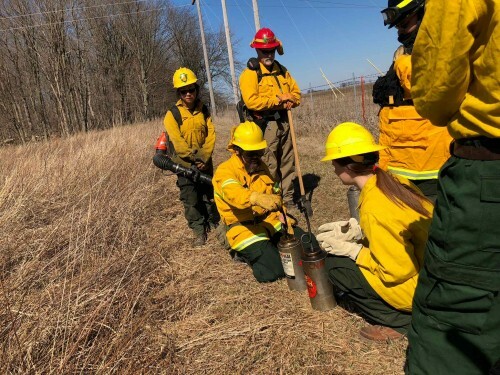 Once Team 2 got things going, it became clear that we needed to improve the southern control line, and all rakes and McLeods got to work trenching a line ahead of the drip torch. 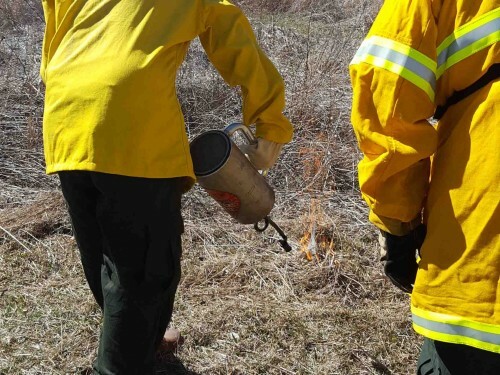 Those with flappers followed behind to snuff out spot fires and ensure any smoldering along the edges was put out. As the fire engulfed more of the prairie, the flames and smoke intensified, the fire generated its own wind. Thick black smoke billowed above us and fire whirls spun flames and ash like tornadoes. 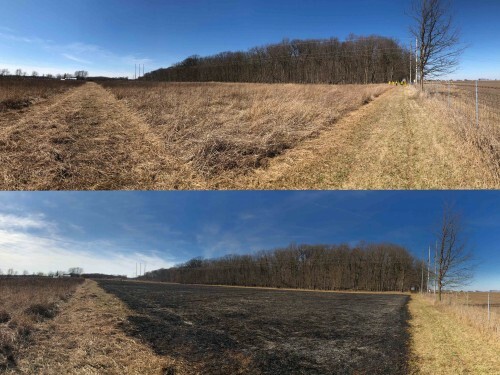 When we reached the western edge of the grassland, we had burned a 20 foot wide strip in addition to the 10 foot control line between the rest of the grass and research plot. This tediously created area devoid of fuels would keep the fire from being able to jump to the research plot or the bean field, while the wind would keep the fire out of the woodland. 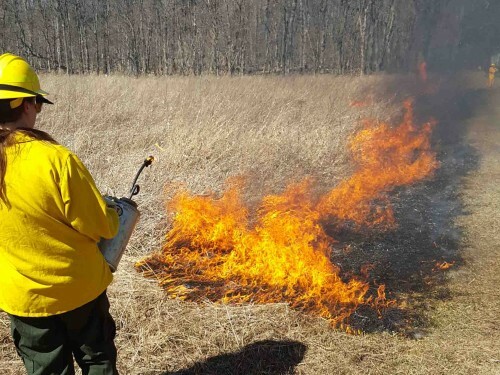 We could now safely start a headfire that the wind could carry across the remaining grasses. Once the area had been cleared, we walked the perimeter one last time to make sure there was no smoldering and nothing left behind. 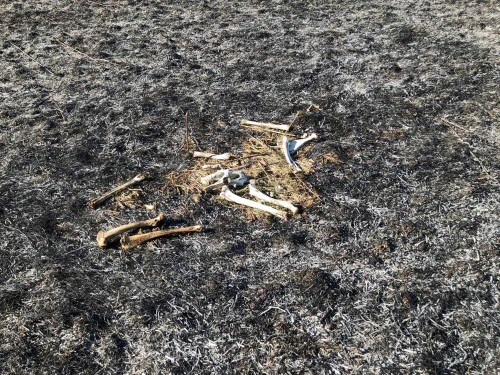 The only thing left unblackened were the bones of a deer that had been been picked clean by scavengers long before our fire. Our final test was our After Action Review where we discussed what happened, what was good, what was bad, and what we learned. 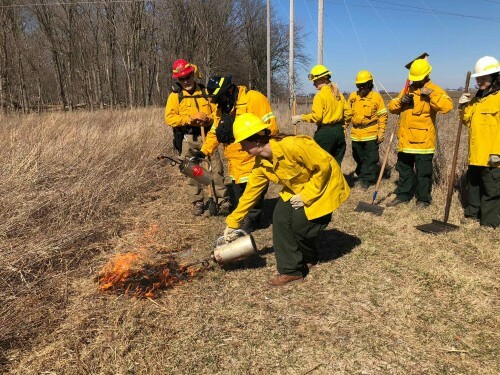 For many, this was the first time that close to a fire and the heat and intensity was greater than anticipated, but all look forward to future opportunities to use this powerful tool. Mussels are often referred to as “the livers of the rivers” because they filter materials from their environment. 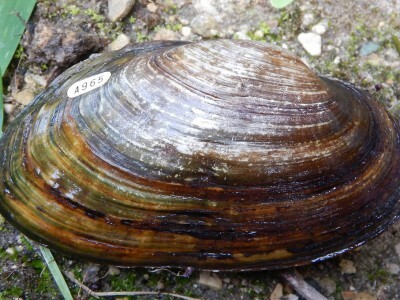 Freshwater mussels are also among the most imperiled groups of organisms in the world. 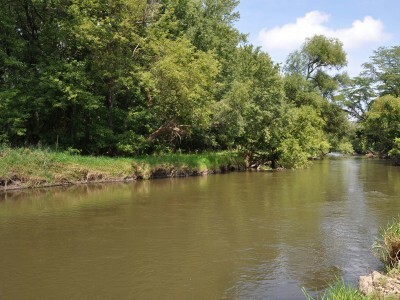 The Kishwaukee River basin in northern Illinois remains one of the most mussel-rich resources in the state. 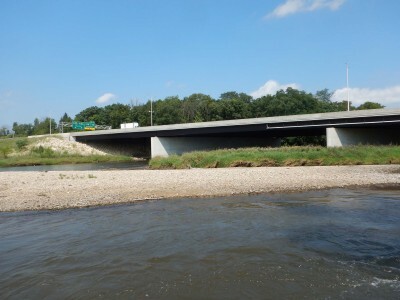 In 2012, the Urban Biotic Assessment Program (UBAP) began studying the fishes, reptiles, amphibians, and mollusks of the Kishwaukee River along the Illinois Tollway I-90 overpass. 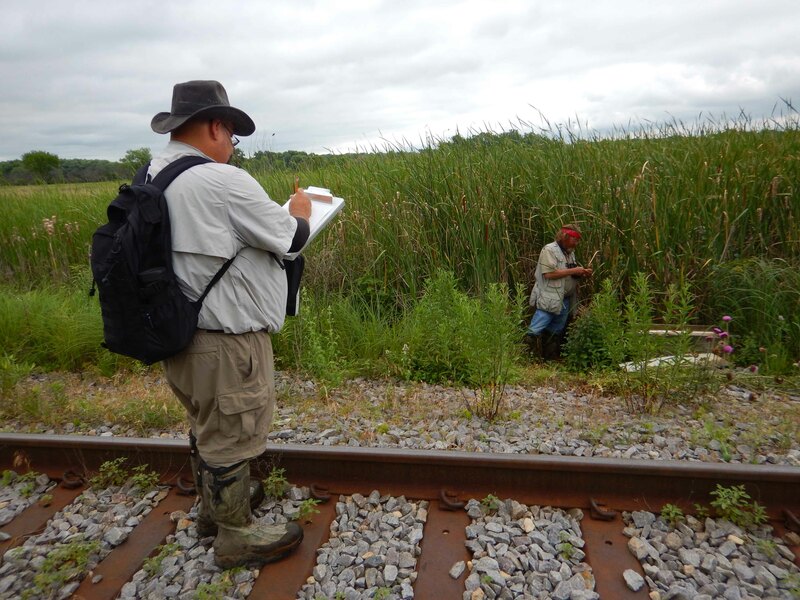 In 2015 UBAP began a longterm monitoring program of the mussel population at the site. 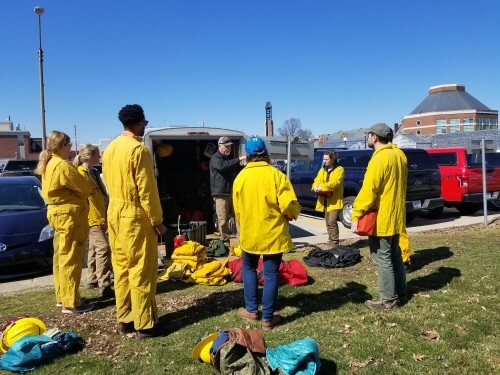 Each August, a team of researchers from INHS, IDNR, and local land management agencies descends on the same location and intensively samples the mussels in the area over the course of a week. We arrived at the site around 8:30 and began unloading and setting up all of the gear needed for the day. 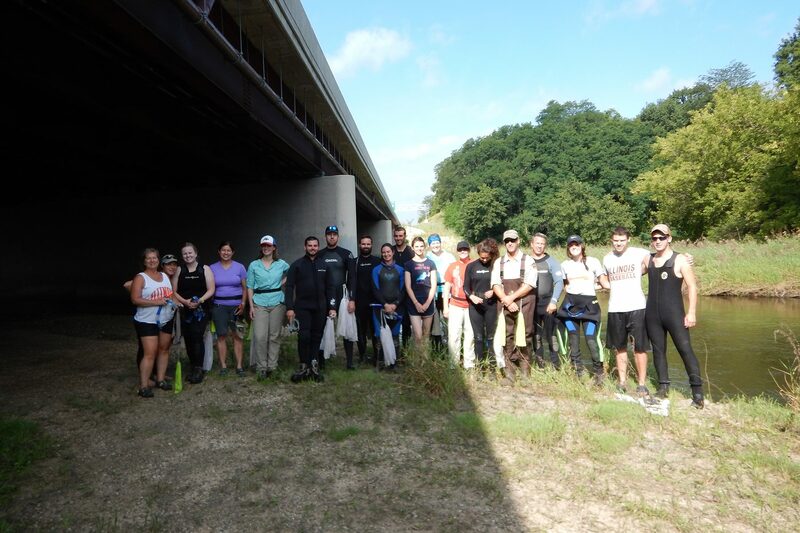 A group of 20 biologists and land managers eagerly grabbed sampling bags, donned wetsuits, waders, snorkels and masks and each claimed their 10m stretch of the river. 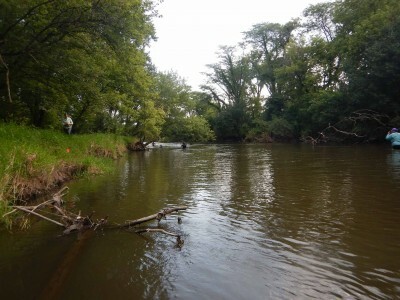 When given the signal, we plunged our heads into the swift moving, 70F water to begin locating every mussel we could in our stretches of river and placing them in mesh bags attached to our waists. Much musseling is done by grubbing – shoving ones hands into the sediment and feeling around for mussels, which feel a bit like smooth rocks that hold on in the gravel with a fleshy foot. For some in the group, this was their first time musseling, and finding their first mussels was exhilarating. After 30 minutes of sampling, we brought our bags of mussels back to the base station. 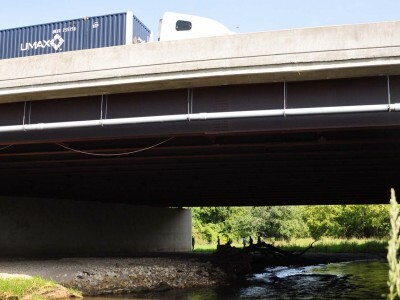 Here, under the bridge with its constant rumble of vehicles speeding by, numbered tags were glued to each mussel. Some of the mussels also had a Passive Integrated Transponder (PIT) tag glued to their shell, which will enable them to be detected in the future without being removed from the river. 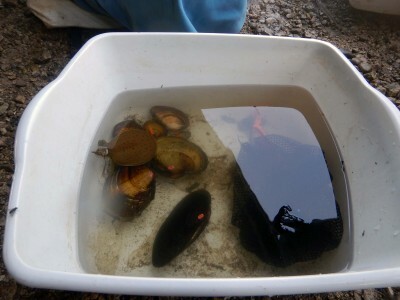 Malacologists identified, measured, sexed, and aged each mussel before putting it back in its bag to be returned to its place in the river. We continued these sampling sessions until the entire project area had been sampled. 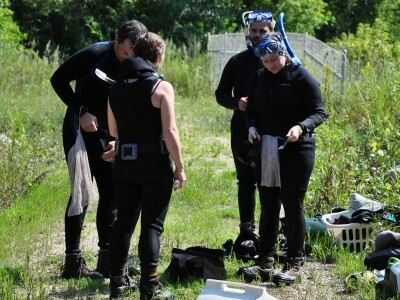 Over the lifetime of this project, thousands of mussels will be marked and measured. 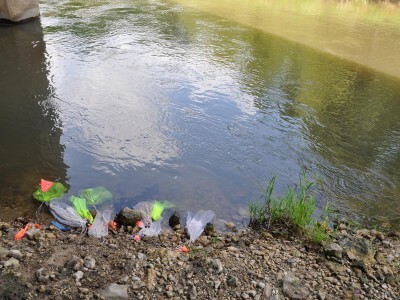 Many of the mussels we encountered had been marked in previous years, which will enable the scientists to document growth and survival over time as well as movement within the river. As we left the site on the last day, we all looked forward to returning next year and hopefully finding those mussels and many new ones. UBAP Ornithologist Anastasia Rahlin presented a poster at the Ecological Society of America conference held in Portland, Oregon from August 6th-11th. 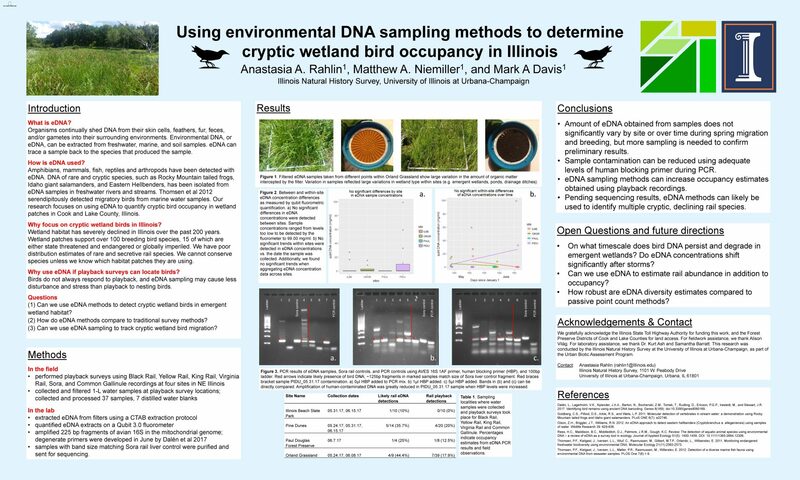 The poster reported on the environmental DNA research being conducted in collaboration with Mark Davis and Matthew Niemiller to collect presence-absence data on cryptic rails in Northern Illinois. The project is testing environmental DNA for bird detection and comparing it to traditional playback surveys. Rahlin, A.A., M.A. Niemiller, and M.A. Davis. Using environmental DNA sampling methods to determine cryptic wetland bird occupancy in Illinois. 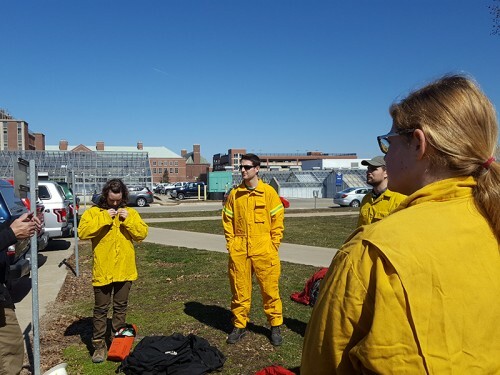 Members of the Illinois Natural History Survey’s Urban Biotic Assessment Program hosted and advised an intern from the National Great Rivers Research & Education Center (NGRREC) 2017 Intern Program this summer. 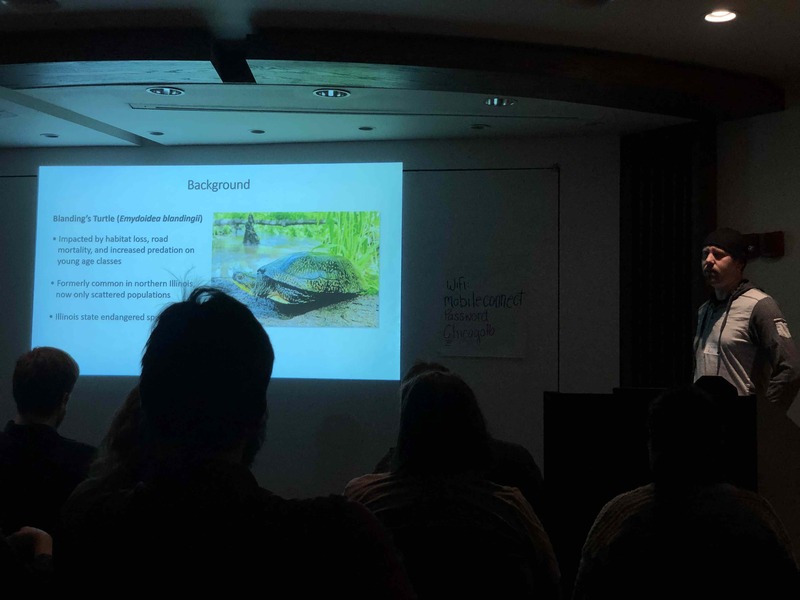 The intern worked on mapping the spread, determining geometric morphometrics, and genetics of a novel invasive species in the Corbicula genus. They attended the 2017 Annual NGRREC Intern Symposium from 31 July to 1 August 2017. Reasor, E., S.A. Douglass, J.S. Tiemann, and M.A. Davis. 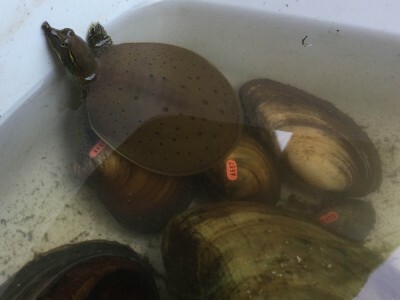 Alien Invaders: Assessing the spread, genetics, and shape of a novel invasive clam. UBAP ecologist Matthew Niemiller accepted a faculty position at the University of Alabama, Huntsville where he will return to his research in cave biology. Matt received his M.S. 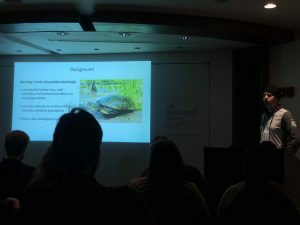 in Biology from Middle Tennessee State University and a Ph.D. in Ecology and Evolutionary Biology from the University of Tennessee-Knoxville dissertation topic “Evolution, Speciation, and Conservation of Amblyopsid Cavefishes.” While with UBAP, Matt was responsible for accoustic monitoring of bats in the Chicagoland area. We wish him well and look forward to continued collaboration.